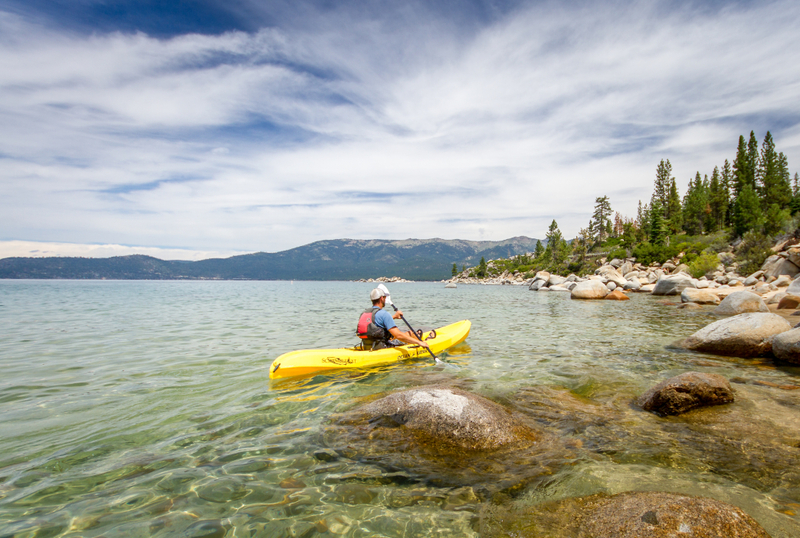 A 72 mile tour of Lake Tahoe with 11 campsites -- there may be no better way to see the lake! A full tour of the entire 72 miles around the rim of Lake Tahoe will require some planning but the paddling itself isn't difficult. SUPers are welcome to join the fun! More or less time depending on if you want to just paddle a segment or the entire circuit. There are 11 legal campsites on the shore of the Water Trail. There are several dog friendly options but note not all beaches allow pups. There may be fees depending on where you leave your vehicles and which campsites you opt to stay at. The Lake Tahoe Water Trail is more like an itinerary than a formal "trail" and it may be the very best way to see the entirety of this astounding lake. The 72 mile route creates a loop around inner rim of the lake and there are 11 different shoreline campgrounds to pull up for the night. There are also 39 launch / landing sites and 17 day landing sites. There are many ways to make the loop and of course, you don't have to do all 72 miles at once. 10 to 12 mile segments are especially popular for 2 -3 day trips. The Lake Tahoe Water Trail was designed so paddlers could tour the entire lake with plenty of legal destinations to stop and enjoy the beauty of this unique alpine area, making it a win-win for both paddlers and the private lake owners who prefer to not have uninvited guests on their land. Because the lake has generally placid water (and the Water Trail stays close to shore), SUPers have joined canoes and kayaks enjoying the overnight adventures. Figuring out logistics such as campsites, daily distances, parking, and shuttles can be a bit of work, but thankfully the LakeTahoeWaterTrail.org website has excellent information on setting up your adventure (there's also the option of using outfitters to handle all the details if you prefer). A normal, full trip around the lake can take anywhere between 3 - 7 days depending on how many miles you want to paddle per day. As mentioned above, the established segments run between 10 - 12 miles per day and you can link together as many as you can. 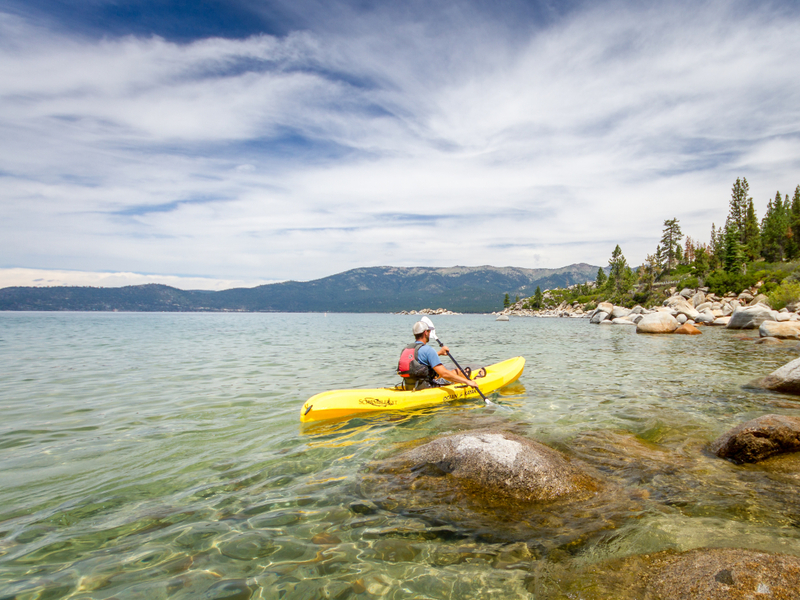 Along the Water Trail you'll literally see all Lake Tahoe has to offer, from the iconic turquoise water to the towering, snowcapped mountains and everything in between. It could be called a once-in-a-lifetime adventure except the face that many paddlers return for more fun! The well-documented tours -- from day trips to week-long epics -- make this a fantastic route for all levels of paddlers and SUPers. Even simple out and backs using the Water Trail maps / system are a fun way to spend a day. Those who want to really see every side of the lake - including the avian life, lesser known parts of the shoreline, the gaudy and spectacular homes -- will get the most out of this adventure. Experienced paddlers who want to put in a few huge days and do the loop in 2 -3 days are going to to love the challenge to putting in big miles on this beautiful lake. The logistics are a big part of this adventure. There are 39 potential places to start and finish. Sand Harbor (used as the directions in the "Get Directions" button below) is just one of the options. To really dial in your trip, please visit the Lake Tahoe Water Trail website. This site is the ultimate resource for trip planning. It's also highly advised to pick up the official Water Trail Map. Plan in advance for your camping / overnight trips with reservations. Dogs are allowed at several places, but not all. See the website for details. Outfitters are available for those who prefer to let others handle the logistics. Even though the lake is normally calm, the weather can change quickly, causing trouble! Be weather aware and check the forecast before your outing.